The A-class catamaran is one of the classes where Catamaranparts and tb PESA began. With over 25 years of experience in the A-Class, the Catamaranparts team decided to produce a design of their own to rival the existing boats. From the outset we focused on designing, modelling and simulation runs with a vision on how we could improve the performance of the A-class catamaran. The Vision A Class comes off production line specifically designed to incorporate the latest building standards. This produces a boat that is the stiffest possible whilst still remaining light, strong and therefore gives the sailor a comfortable feeling of control. - The vision to design a boat which could be used by the recreational sailor for fun and comfortable sailing. 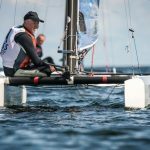 - The vision to design a boat for the competition sailor to race at the highest competition level. - The vision to make a boat ready to race from the box.